You must be a member of the Geneva Nyon Activities Group to attend this activity. Would you like to join this group? 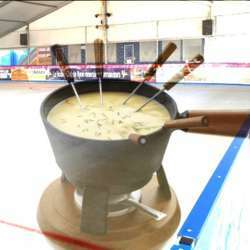 Join us for ice skating (optional) with fondue at the patinoire. The ice skating rink is reserved just for us. Enjoy a fondue with a great group of people. Fondue is naturally inside. Note: pre-payment required. Details below. Note: fondue is required to attend. Fondue is inside. The ice skating rink is covered, and reserved just for us! Payment: via TWINT app (available for UBS, Postbank, Raiffeisen, ZKB, CBV, Credit Suisse, or pre-paid). Download app if you do not have it yet. Enter your payment details. Add me to your contacts (with phone number below). Go to app, make a payment, select me from your contacts, put in the correct money amount Protected content with a glass of white wine, 27 without), write in your name and patinoire Protected content the message line and send. If you for some reason cannot make the app work, message me for bank details but TWINT is much easier and preferred. Your place is not guaranteed until payment is made. Minimum of 20 attendees, maximum of 35.